It will help if you’re familiar with Prometheus, especially when characters from that film receive a subtle reference, but it’s definitely not required. In that same vein you don’t really gain much by knowing the Alien franchise outside of the iconic moments from the first film, and again this merely enhances your understanding without requiring it. It’s a risk, but one that succeeds. 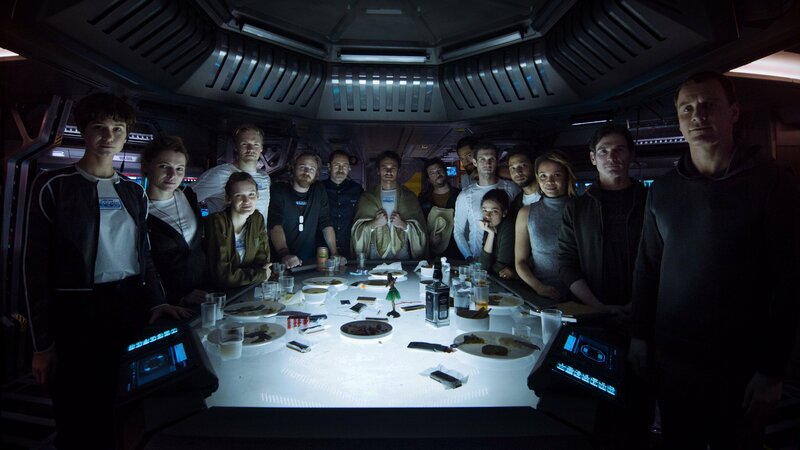 You get to learn of the events following Prometheus, receive the continuation of the xenomorph origin story, and it all wraps with breathing room to either shift to Alien in the timeline or insert another iteration. In fact, my gripes are minor to the point that they seem like they’re digging. I still don’t like the fact that the pacing of all of Scott’s films is a crawl, which is only further exaggerated when you look back and realize nothing much happens in the story arc. It also leaves much to be desired of a sequel, should they do it, because not only is the plot wrapped in a pretty tight bundle here but also because the formula needs to be tossed if you want me to get interested again. These are so minor for what I feel is a decent potential swan song to the prequels of Alien and a somewhat higher ethical conversation that seems more relevant today than ever. Casting was another point of interest, especially when you consider that stoner co-stars James Franco and Danny McBride are part of a horror movie cast. You wouldn’t know it by watching the movie, despite the fact that Fraco isn’t really even present. Every movie has that character that represents the audience and without a doubt McBride’s character Tennessee is that character. He demonstrates a range I would not have expected and properly conveys our voice on screen. Michael Fassbender knocks it out of the park this time around in a performance that has so many levels. For reasons I cannot reveal, you get to see this already talented performer play a character that is removed but parallel for those that saw him in the previous film. He assists us in being our guide through the film, although I can’t say his character is completely relatable (nor is it necessarily intended to be). While I was pleased to see Katherine Waterston (Daniels) and dawning a very different look that I’m used to, as well as Billy Crudup (Oram) who looks exactly like I’m used to, there just isn’t anything of note with their performances. The same is true of the rest of the cast, who all deliver fine performances but really serve as meat for the beast. All in all, you won’t have trouble believing what you see in Alien Covenant. When you toss Alien and Prometheus into a blender, the clear hybrid is Covenant. It doesn’t manage to capture the claustrophobic horror feel of the original film, but barring that limited scope all other aspects are present and accounted for. It will spark conversations about philosophy and ethics if you have the right crowd with you, something I’m eager to experience when I see the film again with others. It also tries to scare the hell out of you, which to me is always the main draw. I don’t know where they go from here, but I think Scott manages to win back both the Prometheus fans and those that feel Alien should have stayed in line with the previous films.